ICM industries Diamond Core Drilling machines in Midrand South Africa 011-312 4814 If busy please retry in 5 minutes. Only if land line not working call 0606107549. In Practice it must not be used for drilling over 75 mm in diameter. This drill is for small jobs and warrantee is only 3 months. 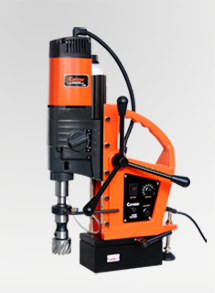 If you are a professional driller you should buy the Cpr205. 1 1/4 of inch screw type end to connect to bits. If you do not print the Direction to our office you shall have difficulty finding it. 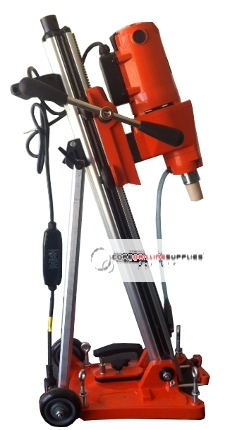 Ø Equipped with safety clutch and current overload protection switch, which can avoid damaging the machine when the drill is blocked or the twisting force is too long. Both Raw bolt and Vacuum can be used. CE, GS, EMC, ROHS Certificates. 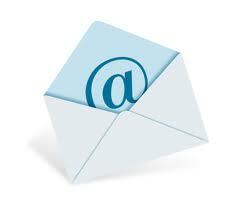 Tel:011 312 3393 If busy please retry in 5 minutes. Selecting the right diamond drill/diamond drill bit parameters, often involves a trial and error process. Many which can be avoided through experience and understanding of how to use these parameter for your specific application. What works for one application, may not work for another. While there is no real substitute for experience, even new diamond drill/bit users can quickly become proficient by learning and applying some basic principles of diamond drilling. Many parts of this guide have been published or presented in several industry magazines or presented at conventions. Diamond Drills & Diamond Drill Bits improperly used are dangerous. Visually examine diamond drill for cracks or any other damage. Do not use if damage is suspected. Damaged, incorrectly mounted, our misused drills can be very dangerous to use. Always wear proper safety equipment: Safety footwear, snug fitting clothing, safety goggles, hearing and head protection, and proper respiratory equipment. Make sure to check the diamond drill for run out. Run out will cause excess vibration when your are drilling and effect the circumference (roundness) of your hole. Instead of your hole being perfectly round, it will become ellipse and uneven. Diamond Drill/Bit run out will also affect tolerances you are able to achieve. Every diamond drill is made to hold a specific tolerance and run-out. When ordering diamond drills, make sure to indicate the run-out and tolerance you need. To check for run out, use an indicator specifically designed for this purpose. Bring the indicator close to drill, until its spring just touches the surface of the drill. The dial of the indicator should indicate 0. Turn on your drilling machine, holding the indicator firmly in place. The dial of your indicator should remain at 0 while your drill is running (rotating). This means you have no drill run out. If your indicator is greater than zero, your drill is running out. Turn off your drilling machine, and remount the drill. A black marker, is an alternative if you have don’t have an indicator available. Take a piece of paper or any thin piece of material, measuring its thickness using a calliper or micrometer. Place the material firmly against the drill. Holding the marker firmly in place, remove material between drill and marker. Turn on your drilling machine and observe drill rotation. If the marker touches surface of the drill, there is too much drill run out. Turn off drilling machine, and try again. Another effective way of checking drill run out, is rotate the drill head assembly (including the water swivel adapter, if your drill has this feature) by hand. The run out of the drill diamond section (the cutting/drilling edge) will be indicated by the stem. A strong correlation exists between the run out on the water swivel adapter and on the diamond drill—the larger the run out on the water swivel adapter, the larger the run out will be on the drill. If the run out is not properly indicated, the drilling operation will not be accurate. You should also ensure that your drilling accessories are properly held in the chuck. If the drill or drilling device is not running true, loosen the chuck of your drilling machine, turn it 90 degrees and run your drill again. If this does not work, examine condition of your equipment. Mount the drill on another drilling machine. Make sure your drilling equipment is in proper condition to accomplish your objectives. No matter how well the diamond drill is made, it will not give you close tolerances if the shaft, or chuck of your drilling equipment is misaligned or vibrates. If for some reason you feel there is a manufacturing defect, please return the drill where it was purchased with a note explaining the difficulty. Defective drills will be repaired or replaced. Drills improperly used will be repaired or replaced at users expense. Line up the drill to the material being drilled. Clearly mark the insertion point where you will start drilling. Drill by quickly pressing and lifting the drill head. Moving the drill up and down frequently during the drilling operation will allow the coolant to cool the drill and flush out the material debris formed while drilling. The colour of the water in the drilling zone should be milky white. For some hobby applications, you can consider using a pilot, which can easily be made from a piece of wood. A pilot can reduce your drill slippage when starting the hole. Place the pilot on the surface of the material being drilled, with the pilot hole above the insertion point. Doing so will help you maintain the drill in place as you start drilling. When making contact with the material, tip the drill at a 45 degree angle. When you have made a slight indentation, slowly bring the drill to a 15 degree angle, gradually straightening the drill as you penetrate deeper into material. Drill by pressing and lifting the drilling head, down and up frequently to allow water to flush out the material debris formed while drilling and cool the drill at the same time. Do not use extensive pressure. If you find a piece of material debris is stuck inside the drill, take it out before continuing to use. Most pilots are used when drilling existing holes (once the material has already been penetrated). The RPM’s (revolutions per minute) are different than for the drill itself. Often the pilot is worn out before the drill. 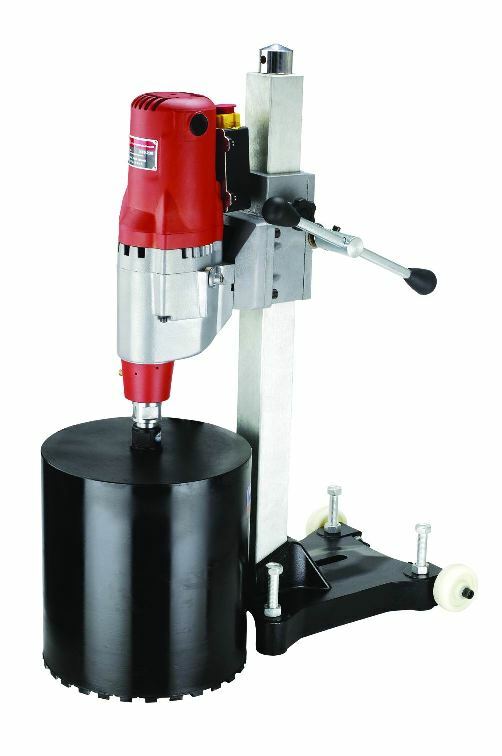 When drilling harder materials, the pilot should only be used when drilling existing holes. This is not necessary for softer materials such as limestone, sandstone, and fiberglass. You can start drilling with drill and pilot right away. A pilot is a drill guide, usually made from 2” x 4” piece of metal or wood. It is extremely important that the part you are drilling is clamped down and hold securely in place. So material does not move, if material does move while drilling it may break the diamond section of your drill. A clamp should be used for this purpose. Do not hold the part (material) with your hands. Doing so is dangerous, and your material will chip. For drilling thinner materials and substrates consider using heavy duty double sided tape to firmly hold your material in place. To maximize the life of your drill and minimize material damage, it is important to run your drills at the proper drill speed and pressure. Drilling speeds vary with diameter of diamond drill, diamond mesh size, coolant being used, diamond bond type and hardness, as well as material hardness. Micro Diamond Drills from .001” required drilling speeds as high as 150,000Excluding RPM. Whereas very large diamond drills 48” diameter require drilling speeds as low as 3 RPM’s. Below is a chart of Recommended RPM's (speeds) in correlation to diamond drill/bit diameter. Please note this chart is for reference purpose only to be used as starting point only. RPM's will vary with material being drilled, material hardness, density, geometry, drilling depth, environment, and operator objectives. Soft, abrasive materials can typically handle higher drilling speeds, while hard, dense materials require much slower speeds. Faster drilling might appear to increase your production efficiency, but the trade-off is a significant increase in friction and heat, which considerably reduces the drill life and increases the risk of heat fractures and breakage in the material being drilled. marks at the diamond section, the drill is being used is too fast or the amount of pressure is too great. Reduce drilling speed or adjust pressure accordingly. It is generally recommended that you use a drill as fast as it will drill freely. Coolant should always be used to cool and lubricate the drill. The most frequent cause of diamond drill damage is drilling without enough coolant. Never run a diamond drill dry—coolant should always be used to cool and lubricate the drill and to flush out abrasive particles formed while drilling. When used without coolant diamonds turn into carbon under high temperature. This is known as the reverse osmosis process. Water is the most frequently used coolant because it typically provides excellent Proformance at a minimal cost. Water is a true organic coolant, which does not leave the material being machined oily, greasy, or contaminated. 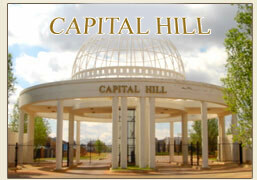 City water with 90 psi or running water is usually used for drilling. The coolant must also be applied in the right place to ensure that it properly cools the drill and the material being drilled. The coolant should be directed so that the full flow is at the point of contact between the drill and the material, facing the same direction as the rotation of the drill. When drilling on a vertical surface (not recommended for advanced ceramic materials), use a squirt bottle or small cup of water to continuously pour water onto the drilling zone. Make sure enough coolant is reaching the drill. Alternatively, you can submerge the material into a shallow tub of coolant so that the coolant just barely covers the material surface. If coolants cannot be used, consider using air to cool your diamond drills. 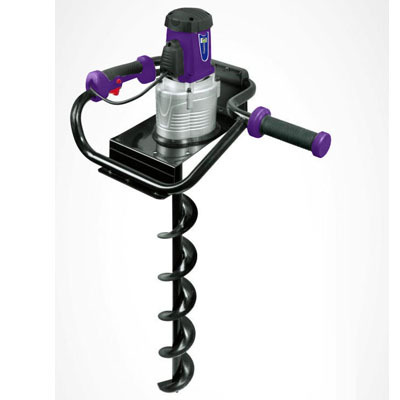 If air cannot be used, a resin bond or electroplated (nickel bonded) diamond drill may be a solution. When drilling in harder materials such as granite, agate, quartz, porcelain, or very hard materials like sapphire and alumina, it is important to have lots of coolant. Running water through the centre of your drills, is the best way for drilling these materials. This can best be accomplished by using a water swivel adapter. Doing so, you will have constant water pressure following through the centre of your drill. Which you will be able to regulate. All diamond drills with female collet (thread) can be used with a water swivel adapter. Such as sintered (metal bond) diamond drills or Electroplated Thin Wall diamond drills . If you are using electroplated (nickel bond) core drills, you will need to drill with a small amount of water constantly running over the diamond core drill and bore hole by using something like a garden hose. For some applications, you may want to use an additive with your coolant. If you Fenide to go this route, you will need a circulating system and the right ratio between your additive and coolant. use a squirt bottle or even a small cup of water to continuously pour water onto the drilling zone. Observe hole to make sure enough lubrication is reaching the drill. submerge the material into a tub of water. So water just touches material surface. consider using a water swivel adapter to provide coolant through the centre of your drills. Water swivel adapters provide the most efficient and effective method of coolant. should you find yourself in a situation where a water swivel adapter cannot be used, use a garden type of hose which can be easily obtained from any hardware store. if this is not possible, use a squirt bottle to provide coolant to your drilling zone. Provide coolant through the centre of the diamond core drill. Water Swivel adapter cools both diamond core drill and material in zone of drilling. Water swivel adapters come with a valve for adjustable water flow. On Average, diamond drills used with water swivel adapters will last 40% to 75% longer. Diamond Core Drills used with water swivel adapter will not overheat material and prevent cracks that occasionally arise from drilling. Drilling generates dust. Excessive airborne particles may cause irritation to eyes, skin and respiratory tract. To avoid breathing impairment always employ dust controls and protection suitable to the material being drilled. You will find the more pressure you have on your coolant, usually the better your drilling results will be. Strong coolant pressure will wash out material debris (centre plugs) stuck in centre of your drill. Centre plugs restrict coolant flow to centre of drill and prevent coolant from reaching the diamond section. Your drill swill start to drill dry, significantly reducing your drill life, material surface finish, and deteriorating overall Performance. Centre plugs preventing water reaching the diamond section, are behind 90% of all drill wreckage. When drilling with diamond drills, the proper use of coolant is important for two reasons. Frictional heat produced at the working face of diamond tip must be disposed immediately. Otherwise the diamond become rapidly damaged by oxidation and graphitization. Excessive heat generated while drilling will also damage the metal matrix holding the diamonds in place. Debris generated while drilling should be removed as soon as they are produced. When this drilling debris is not removed rapidly, diamond wear increases through abrasion caused by the presence of excessive coarse stone fragments. Water is the most common coolant used for many drilling applications. It is always a good idea to pump an adequate supply of water or coolant through the centre of the drill. So that an uninterrupted flow is maintained flushing across the working surface of the drill diamond section. In this way diamonds and the metal matrix are both kept sufficiently cool. And material debris is removed as soon as it is produced. This is the most optimum condition for your drill. Water/coolant also penetrates the micro-cracks witch are generated upon impact of material and diamond drill. Under ideal conditions, the material will absorb water/coolant, hence becoming completely saturated with water/coolant. In this state the material is weaker and more easily drillable. The coolant surface tension also plays an important part in the drilling operation. Usually the lower the surface tension, the easier it is for the coolant to enter the micro cracks. Coolant with a lower surface tension also wets the diamonds more easily. Most users find that by lowering the surface tension of their coolant, resulted in better cooling (wetting) of their diamond, and more effective overall cooling. Lower surface tension also improves material debris lubrication, promoting efficient removal. It is also very important to apply the right amount of pressure during drilling. Use light to medium pressure, gradually feeding the drill into the material, until the drilling begins to progress at its own speed. Increasing pressure on the drill will do little to reduce the time it takes you to complete a hole, but it will cause your drill to overload and overheat, which will lead to excessive wear on the drill and defects in the material being drilled. When you are drilling completely through a piece of material and the hole is near completion, reduce the drill pressure considerably to minimize chipping of the material. Never force a diamond drill. Apply even pressure until the drill and material just touch. Since the drill and material surface are not perfectly even (symmetric) to each other, this lets the drill surface become sharper and adjust to the surface of material. If a diamond core drill develops dark “burn” marks at the diamond section, the drill speed is probably too high or the amount of pressure is too great. Reduce the drilling speed or pressure accordingly. Using frequent up and down motion when drilling will help propel coolant deeper into the hole being drilled. It is highly recommended that drilling should be done in even intervals. Drilling for about 30 seconds, lift diamond drill up from drilling zone to let it cool in air and diamond and coolant reach further into the drilling zone. Following this technique will reduce pre-mature and uneven diamond drill wear and avoid diamond drill/bit wreckage. Drilling speeds are affected by the hardness and abrasiveness of the material, age and condition of equipment, pressure and coolant. Experience with a specific material and applications allows the operator to develop the right drilling process for their particular application, and taking into account all of the factors discussed above. New users, who are just beginning to drill with diamond drills, are better off starting to drill at low speeds, low pressure and with a large amount of coolant. Until they are able to build their experience using a specific diamond drill, set up, and application. Doing so will minimize the risk of diamond drill and material damage. When drilling with core drills in material over 1/2" thick, it is recommended to drill to a depth of about 1/2", then remove material debris with a chisel or screwdriver before continuing to drill. If you are using a water swivel adapter, increase the water pressure until, the debris stuck inside is flushed out. If you are drilling a thick piece of material, repeat this process several times. Continuing to drill without removing material debris stuck in the centre will cause the drill to burn up, since enough coolant is unable to reach the drill. Applications require drilling depth of not more than 1”. Applications requiring you to drill over 1” should be tread in a different way. We recommend running coolants from multiple directions. Through drill centre, from side of drill, as well as drilling submerged in coolant. This will insure maximum amount of coolant and lubrication reaching your drilling zone. Apply more pressure and reduce speed the deeper you penetrate into your material. Lift drill up, after every inch drilling into your material, letting the drill cool and coolant reach deeper into your hole. Carefully examine the diamond tip condition, making sure its round, and not overheated. Your maximum drilling depth will also be limited by spindle travel. The distance your drilling equipment can move in an upward and downward motion before touching the surface of your material. Make sure to take this into consideration when ordering diamond drills. Diamond Drills usually have a drilling depth of about 2" to 2-3/4", with the shaft being 1" to 2" long and the diamond depth (diamond section) being about 8mm. When drilling deep holes, beyond the diamond drill depth, the drill chuck may come into contact with the surface of the material being drilled. 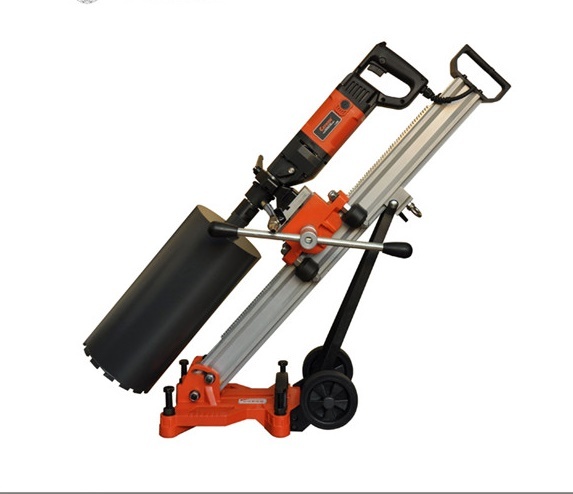 A drill tube extension can be used to lengthen the drill drilling depth. 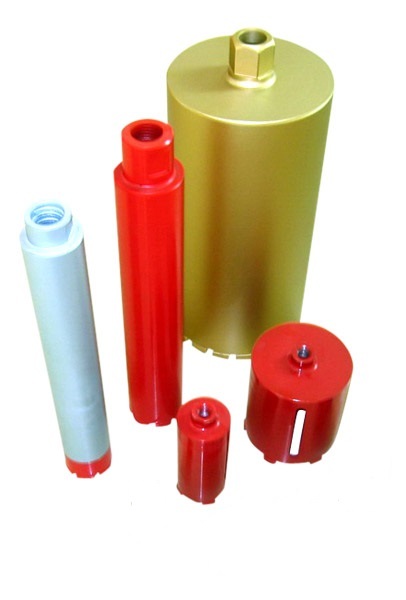 Various sized tubes (core drill) extensions can be purchased at most hardware stores, building, contractor, and do-it-yourself supply centres. Applications requiring you to drill over 1" (25.4mm) should be tread in a different way. We recommend running coolants from multiple directions. Through drill centre, from side of drill, as well as drilling submerged in coolant. This will insure maximum amount of coolant and lubrication reaching your drilling zone. Running high pressure of coolant through centre of your diamond drill/bit by using a water swivel adapter is highly recommended for drilling material over 1" (25.4mm) Thick. Longer Drilling depths may require drilling in several steps and using more than one diamond core drill / diamond drill bit. Small diameter diamond drills must be used at significantly higher speeds than larger size drills. It has been found that higher Revolutions Per Minute (Ram's) improve surface finish and overall drilling Performance. Ram's for diamond solid drills .001” to 2.5mm (without centre hole for coolant flow capabilities) range from 9,000 to 450,000. Drilling equipment that can accommodate these speeds include: high speed air spindles, hand held drills, and other specialty micro drilling equipment. High speed air spindles can run up to 450,000 RPM, hand held drilling machines to 35,000 RPM, and specialty micro drilling equipment up to 25,000 RPM. All diamond solid drills and diamond micro drills must be used with coolant. We recommend either drilling submerged in coolant, or applying air as coolant (in some cases), if other liquid coolant types cannot be used. Smaller size diamond core drills 1.6mm to ½” (mounted on a collet with thread and designed to run coolant through centre of drill) must run with high pressure of coolant 45 PSI through centre of drill. This is the key successful drilling very hard materials. Drilling submerged in coolant is not recommend. Once the core (material debris) becomes stuck inside the drill, coolant is blocked off from the drilling zone, and the drill can no longer be used. It is very important that you periodically check the inside of the drill for material clog up. If you spot the material core becoming clogged up, flush out this debris using coolant pressure from a water swivel adapter or other coolant source. Continue drilling only after the debris has been removed. We recommend that you use diamond core drills 1/2" and above on a drill press. Most Diamond Drills can be dressed (retrued) several times. Usually the wear on the diamond drill depth takes place on the drill core and diamond section, as well as wall thickness. A diamond drill can be returned by facing off the drill depth with a SiC wheel to the point where the wall thickness is standard. Retrueing (dressing) causes diamonds to be pulled out from the drill diamond section (diamond tip). For this reason, great care should be taken to reduce this effect. We suggest exposing the diamond section with a Al203 stick after retrueing. This is a very simple operation: just drill into the dressing stick a few times. Start by drilling in approximately ¼” (6mm) deep into the stick, this should be done two to three times (when drill is seriously glazed over, it may be required to drill as many as 20 times into this dressing stick to correct the problem). MAKE SURE TO KEEP COOLANT FLOWING. Coolant should flow over the dressing stick. Dressing without coolant is worse than not dressing at all. a.) Sound – when a diamond drill is sharp and in good cutting condition, the drill will give off a “hissing” sound. When the drill requires dressing, a :shrill screech” sound will be heard. When this sound is heard, stop drilling and dress the diamond drill. b.) Pressure – when using a diamond drill, pressure needed to drills also a good indication of when to dress. The normal amount of pressure required to drill a piece of glass is 23 to 30 pounds as an example. If after drilling for a while, the drill requires additional pressure to drill, this would be a good time to dress the drill. c.) Time Cycle – the indicator is much the same as a pressure top-off. If drilling cycle becomes excessive, stop drilling and dress the drill. Proper diamond drill care and maintenance is very important for optimum drilling Proformance. Maintaining the diamond section shape and rigidity is important to prevent the drill from loosing its sharpness and roundness. Make sure to repeatedly dress and retrue the drills diamond section to rexpose new diamonds. If you see the diamond drill has lost its shape or rigidity, send it back to the manufacturer to be retrued. Sintered (metal bond) Diamond core drill, 5/16” in diameter was used to drill 0.070” thick alumina substrate mounted on double sided tape. Hole # 1: Diamond Drill was not dressed before use and also shows signs of significant run out. Hole is out of round and shows signs of diamond drill hitting (hammering) surface of material, before making indentation. Hole # 2: Diamond Drill was properly mounted and checked for concentricity. However, diamond drill was still not dressed before use. Hole # 3: All proper diamond drilling procedures were followed. Diamond Drill was properly dressed and is running concentric. Diamond Drill Life & Overall Proformance will vary with material hardness, density, Drilling Depth. Few other factors that play a role in diamond drill life include: RPM's (drilling speed), Feed Rate, Geometry (shape) of Material, Coolant being Used, Coolant feed rate and Direction. Drilling Equipment, Material Clamping Method & experience of operator. While there is now way of accurately predicting Life of your diamond drill. It can be optimized by following Principals of Proper Diamond Drill / Tool Usage. There may also be some experimenting, as well as trial & error involved in the part of the end user. Highly experienced diamond drill users may find some variations in diamond drill life or Proformance even when working on same material & application for several years. While this phenomena is not too common, it does occur. Each variable of the diamond drilling process is only one of the many components of a larger diamond drilling system (equation). Changing one component or variable of diamond drilling process cannot create efficiency alone. Only when all components of the system added together can desired outcome be achieved. Just like a mathematic equation, it takes only one incorrectly select variable/component to affect all other properly selected variables. Making the entire diamond drilling equation/system incorrect or inefficient. Many end users approach their diamond drilling application uninformed or misled. Errors are made in the set up phase and critical steps are skipped. When problems do surface, most rush to treat a symptom rather than the cause. Frustration leads them attribute their problems to diamond drill drill being used. What some customers refer to as serious problem for example, may be resolved by something as simple as adjusting RPM’s or feed rate. The solution can be as easy as changing mounting method, properly mounting drill in machine chuck, or educating customer about need to dress diamond drill. When encountering problems or variation in diamond drill Proformance. Few stop to think about or carefully examine their drilling process. Many users immediately suspect quality of the diamond drill and are quick in labeling the drill "Defective" or "Poor Quality". This is very rarely the case. Usually in over 90% of these cases the diamond drill itself was not at fault. Most Respectable & Experienced Diamond Drill Manufactures have rigid quality control and inspection processes set in place. Controlling everything from raw material input, output, to final inspection. What a number of diamond drill users don't realize the technical aspects & delicate nature of diamond drilling/machining process. Unlike carbide, high speed steel, & other types of drills. Diamond drill works by grinds away material on micro (nano) level. Carbide and other types drills on the other hand cut material with a sharp cutting edge. A simple example of the minute details and understanding that play a major role in your diamond drilling process. What is important to understand is that almost all diamond drill/bit users, regardless of experience or technical background will make some type of an unintended operator error while using their diamond drills/bits.